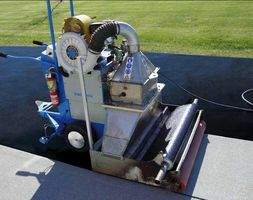 The MINI-MACADEN® is a machine for laying bituminous membranes developed by SOPREMA. Self-propelled and self-guided, it provides the peeling, welding and bonding rolls of 8 or 10 ml. - installation and wrinkle free without blisters. The flame-free system, reduces the risk of accidents and reduced gas consumption (reduction of over 50% compared to manual welding). The use of the MINI-MACADEN® improves working conditions for staff by reducing manual handling and welding operations. 1. The roller is mounted on the chassis machine and the membrane is engaged, the machine is pre-aligned. 2. Turning on the MINI-MACADEN® : advancement and automatic guidance. 3. Visual monitoring of welding for possible adjustment speed. 4. Stop the burner at the end of roll. 5. Manual welding the ends of the roll. For optimum performance, the MINI-MACADEN® requires the following operatives: of an operator MINI-MACADEN® , one operator for welding the ends of rolls and two people to handle rolls.